September 2014 – Page 2 of 10 – Yow Yow! I grew up watching almost all of the reality singing television series, but none have ever really stuck with me as much as The Voice has. When I heard that Gwen Stefani and Pharrell were joining the judges’ table this season, I was excited, but I didn’t know if I had it in me to watch another season. I mean after six, you would’ve thought that we would have found all of the amazing singers by now. Not true. I caught the second day of blind auditions after work last night and was completely moved by two performances. I can’t believe I used the word moved. Let’s just say I liked them enough to throw them into a post and call it good. I didn’t know it at the time when I was taking this shot, but I was totally following in the footsteps of my blogging icon Joy Cho of Oh Joy! It has been several years since I read her blog for the first time, but I am still such a huge fan of hers and her daughter Ruby of course! 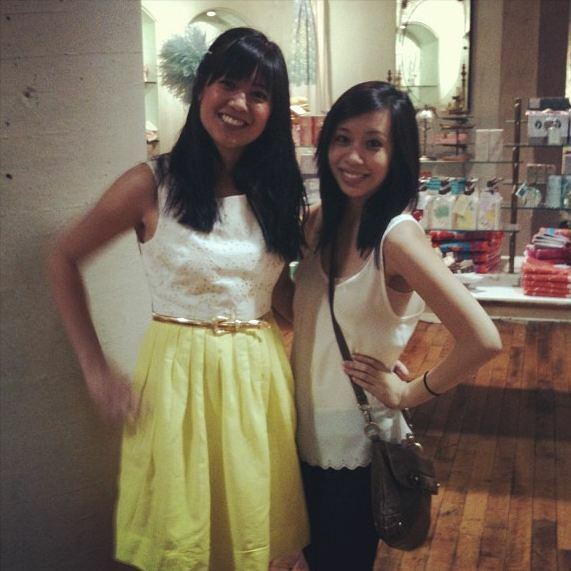 I also had the pleasure of meeting Joy last year at Anthropologie in Seattle when she was helping them launch their Petites collection. Joy really is such a great role model for women everywhere and I’m having a great time enjoying reading Blog Inc. 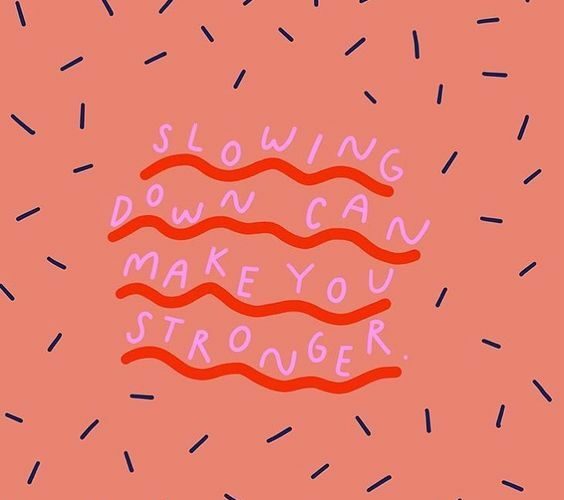 Even though I’ve been doing this for some time, everything that I’ve learned, I’ve learned by doing and by intuition so it’s refreshing to really dig in and learn from an expert! Today we’ve got a Wedding Mondays / Song of the Day feature because the wedding we’re showing today belong to none othre than the lovely Kina Grannis. She decided to turn her wedding video into the music video for her song “My Dear” and we are loving all of the highlights including the 8mm footage throughout. The wedding music video actually was released on her first anniversary to her husband so it’s kind of sweet that she’s sharing this with all of her fans one year later. Happy Monday y’all and a very happy birthday to my bestest Ashley! This Wedding Monday and most Wedding Mondays are dedicated to her! 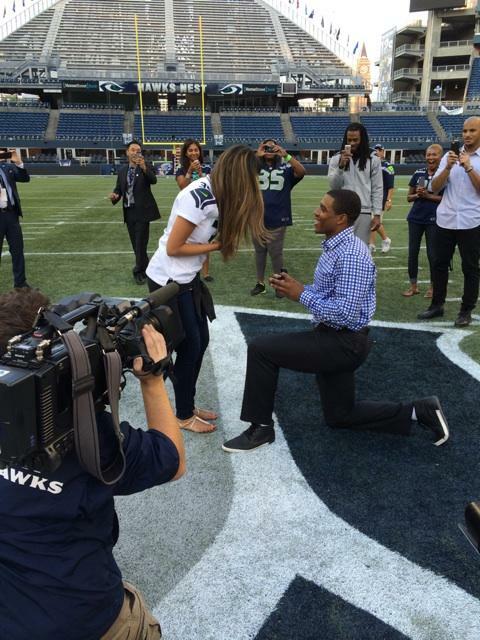 Since we already had a “Photo of the Day” yesterday, we decided to push back this sweet sweet moment (so we can remember that the Seahawks won yesterday) of Deshawn Shead proposing to his girlfriend on the field after we beat Denver. I came into work on a Sunday yesterday to get ahead for the week and in a moment of weakness – or just a moment that I didn’t want to spend working, I took a snapshot of my desk set up. I’ve always enjoyed seeing how other bloggers arrange their desks and find it interesting what people generally keep on them. 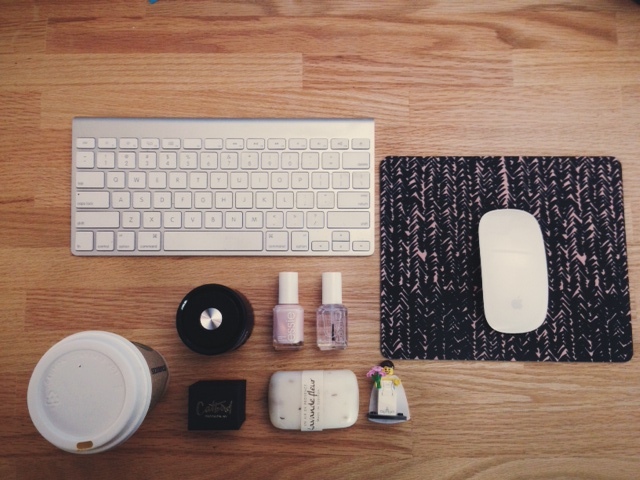 The Essie nail polish should probably come home at some point, but the soap was a gift from my manager from Paris and generally makes my entire desk area smell good. My wedding bride lego was a gift from an old friend (because she had collected too many of them) but also because I just love weddings and there’s really no better place for it than at my desk.